This Saturday was the 22nd anniversary of the Flying Pig Bookstore. It has been almost two years since I retired from the store and being a customer at store is delightful. I find myself popping by the store a lot lately. Going to the store is a lot like having coffee with a fun friend. The conversation is delightful and it leaves me feeling good. There is often something unexpected that happens at the store; either I wind up helping sell books or I get to visit with customers I’ve missed. 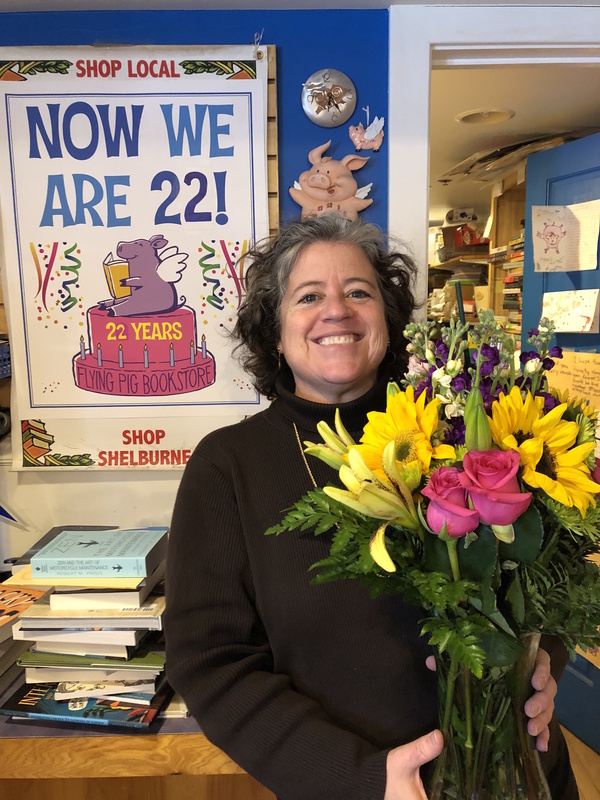 Elizabeth with celebratory flowers on the store’s 22nd anniversary. I get to see the store with very different eyes than I did for 20 years as an owner. Rather seeing everything that’s wrong, missing, askew, dirty, etc, all I see are masses of books with their riot of colors making promises about great stories. The store is so colorful in a very calming way. It feels very warm and inviting. The new shelf talkers are fun to read. And I have to read these because I don’t know the books anymore. I am enjoying getting to know the new books. For the first time they actually feel new. There is something about ordering frontlist so far ahead that can take the fun out of new release day. Now, every day feels like that because there is always something new to see at the store. I read reviews and then forget them unless it’s a book I want to order. Unlike some customers who have a particular bookstore schedule (you’d be surprised how many people do) I pop in at very random times, ensuring that I can see as many staffers as possible. One thing I particularly love is visiting with former staffers and getting caught up with their lives. There are several new staffers who seem really good and I’m sad that I can’t really work with them. I do delight in zipping behind the counter and ringing myself up if folks are busy. There are still some customers who comment when they see me in the store, “I never see you here anymore.” I have to remind them gently that I don’t work at the store anymore. Then they ask me for a book recommendation. The really nice thing about being a customer is I don’t look at the inventory and worry about paying the bills. I just think, “Damn, this art supply section is amazing.” I also can see that Elizabeth has done some elfing and the store looks invitingly ready for the holidays. The art section will be decimated by Christmas Eve, the pencils alone are to die for. There is something so lovely about being a customer now. I call and order books and get text messages that my order is in and I’ve had nothing to do with it. I love that part. I can now understand better what it has meant to the community for the last 22 years. It is really a place of inviting calm in an angry world. This entry was posted in Uncategorized on November 27, 2018 by Josie Leavitt. Congratulations to Flying Pig! Wish I lived closer!